The 22nd September was an auspicious day for television history; we were treated to the sight of a plank of wood bursting into tears. Yes, Britain’s favourite period drama is finally back! If you’re new to the show then don’t fret, every episode is more or less the same. The residents of Downton Abbey must cope with life in the early 1920’s and the problems that arise from being vastly wealthy and having to deal with servants waiting on you, hand and foot. However, the cast is split between ‘upstairs and downstairs’ giving us a glimpse of what life is like to work under the aristocrats who need people to dress them several times a day. We start with the first episode of season 4 focusing mainly on the death of the heir to Downton, Lady Mary’s husband Matthew Crawley (Dan Stevens) and the fallout this creates. For the best part of an hour we’re subjected to Lady Mary (Michelle Dockery) wandering the Abbey with her face completely frozen in place and devoid of any emotion. She delivers such a jarringly wooden performance that she could be replaced halfway through with a scarecrow and you would struggle to tell the difference. That is, until the very end of the episode where her visage cracks and she breaks down into uncontrolled sobbing – although she only gets limited sympathy after having earlier stared at her infant son George with soulless eyes and declared him an orphan. The governing of Downton is down to Lord Grantham (Hugh Bonneville), which is slightly worrying as he has apparently forgotten that he recently watched his youngest daughter die, as during a conversation with her husband he chastises him for not understanding the pain of losing a loved one. The dialogue overall is clunky, overly dramatic and horribly unnatural. Even the Dowager (Maggie Smith), who is normally given the best lines, has this week been reduced to literally telling her granddaughter to pick life over death in the clumsiest way possible. Unfortunately, Downton Abbey is more about its aesthetics and soundtrack than its ‘riveting’ story. As Downton Abbey’s fourth series premiered, it was evident that things were going to be different. 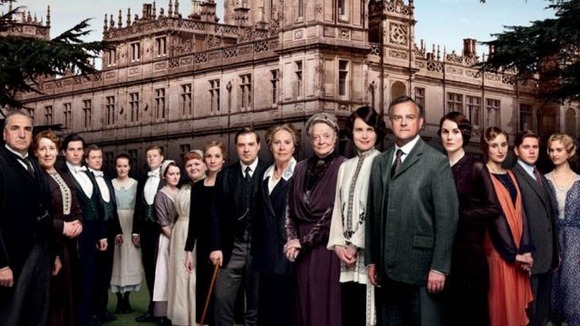 The image of Downton lit up at night against a backdrop of mist was a bleak deviation from the lengthy montage of activity at Downton while the actors’ names are displayed on screen. There’s a particularly poignant shot of Lady Mary lying in bed unable to sleep, while the camera focuses of a picture of her and Matthew’s wedding. Considering how series three ended, with the brutal death of Matthew Crawley, Julian Fellowes’ decision to begin the series six months later was a wise one. Dockery deserves credit for her brilliant portrayal of the mourning widow. “Have a happy time” she says to Edith before she goes to London to do just that, getting swept off her feet by married man, Michael Gregson. Their relationship is sure to provide a source of conflict later in the series. Mary remarks “He’s not bad looking and he’s still alive which puts him ahead of most men of our generation,” revealing that the stroppy, icy-hearted woman we loved in season one is well and truly back. There was even more drama with the news that O’Brien had snuck off “like a thief in the night.” An on-going rivalry between Nanny West and Thomas would have been interesting but Thomas manages to get her fired in just one episode, despite the absence of his partner in crime, O’Brien. Dame Maggie Smith had more than her usual share of witty one-liners with the addition of a particularly touching scene when she says to Mary, “The difference is…I love you” and recommends that she chooses life over death. Whatever your views on Downton Abbey, you have to praise Julian Fellowes for the way in which he overcame the loss of his well-loved protagonist Dan Stevens and the mischievous Miss O’Brien (Siobhan Finneran). Following the Christmas special, there was only so much melodrama one show could take. In stripping back the theatrical plot points like deaths, murders and car crashes, Downton Abbey has once again proved its status as an iconic British drama. Posted in Arts and tagged Flick, Stick, television, television review. Bookmark the permalink.